stem cells. Does research kill human life? A microphotograph of human embryonic stem cells taken at a Brazilian laboratory. This microphotograph of a human pre-embryo consists of seven undifferentiated stem cells in the process of having one stem cell removed for pre-implantation genetic diagnosis (PGD). A few of the cells are not fully visible in this photo. PGD can detect genetically defective cells so that the pre-embryo can be rejected. A consensus exists that that such pre-embryos are alive. They contain human DNA and are thus a form of human life. The controversy over embryonic stem cell research centers on whether human life in the form of an embryo less than two weeks after conception is also a human person. They clearly have the potential to become a newborn some 9 months in the future. But most people in the pro-life and pro-choice movements disagree about whether it is a person when it is at the pre-embryo stage. If it is a person, then extracting stem cells constitutes first degree murder. If it is not a person, then removing stem cells may be morally acceptable. 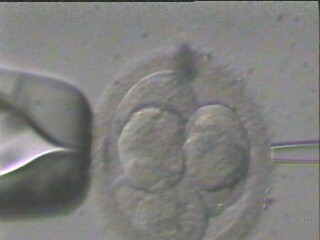 Pro-lifers generally accept that the pre-embryo is a person, because it contains a DNA that is unique to that embryo. Others argue that it is a person because it has a soul created and implanted by God by this stage. Pro-choicers generally reject the personhood of a pre-embryo because it consists of only a few undifferentiated cells. They believe that an embryo has the potential to develop into a person, but is not a person itself. They note that an embryo is not sentient; it has no brain, sensory organs, ability to think, memory, awareness of its surroundings, consciousness, internal organs, arms, legs, head, etc. Embryonic stem cells are a primitive type of cell that can be coaxed into developing into any of the 220 types of cells found in the human body (e.g. blood cells, heart cells, brain cells, nerve cells, etc). In the past, they have always been derived from human embryos in a process that causes the death of the embryos. 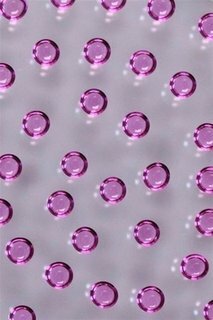 However, new research is developing techniques to convert skin cells into Induced Pluripotent Stem Cells (iPS cells) that emulate embryonic stem cells. Adult stem cells bear some similarities to embryonic stem cells. Research using adult cells has a two decade head start on embryonic stem cells. Thus, potential treatments have already advanced to human trial stage. In contrast, the first experimental tests using embryonnic stem cells only ocurred in mid 2010. Unfortunately, adult cells are limited in flexibility, and are only capable of developing into a few of the 220 cell types found in the human body. Umbilical cord stem cells from newborns are one type of adult stem cells. Induced pluripotent stem cells are specially treated ordinary cells -- e.g. skin cells -- that are specially processed to exhibit some of the properties of embryonic stem cells. Research in this area is just beginning. However the process seems to offer the advantages of embryonic stem cells without the ethical and rejection problems. Many pro-lifers believe that human life, in the form of an ovum and spermatozoon, becomes a human person at the time of fertilization. They view the killing of any embryo in order to extract its stem cells to be a form of homicide. They are generally opposed to such research. Others disagree. Fortunately, if iPS cell technology develops as expected, it will eventually replace the need to derive stem cells from embryos. Does the process of extracting stem cells kill human life? People differ in their beliefs. If one believes that a pre-embryo is a human person, then that person is murdered. He or she cannot further develop and eventually become a newborn. Most people in the pro-choice movement believe that a pre-embryo is a form of human life that might have become a person later in pregnancy or at birth. Many believe that the pre-embryo is killed before it becomes a person, and that this is moral if the pre-embryo would otherwise be discarded. One can make the case that a pre-embryo contains a number of undifferentiated human cells inside a sac. When stem cells are extracted, the sac is discarded and the stem cells are encouraged to divide and grow in number. The only things that are of value -- the multiple cells containing human DNA -- continue to multiply. No killing is involved. The cells live on.